Ok, I gotta admit, they are pretty cute. Not too shabby for the 1st time I've decorated cookies. 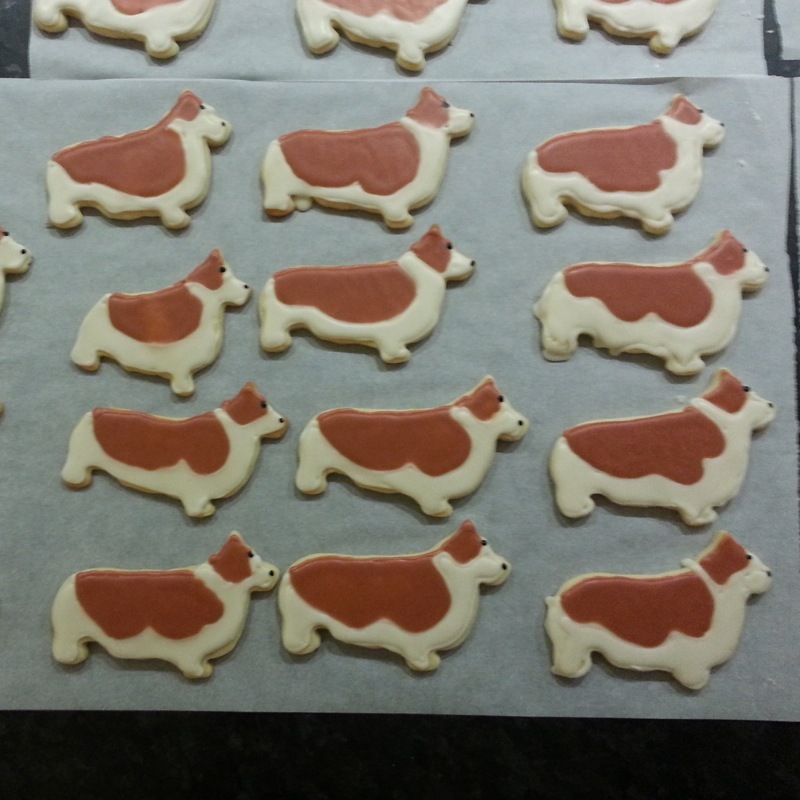 I found the blog post from last time I made sugar cookies. Ok, most of them didn't turn out this bad, but I pretty much swore off making cookie cutter cookies after that. Turns out this is a 4 day process, not 3 days. Because it takes a full 24 hours to let the icing dry. But that's ok, I don't have to do any labor on them anymore. And Jimmy can pass them out on Friday instead of tomorrow. Which works out better, because everyone is staying home tomorrow because of this crazy storm that's going to pummel the Bay Area. It's expected to be so bad that most schools are closed and a lot of employers are telling their people to work from home. A lot of parents have to work from home because their kids are staying home. It should be an interesting day. Anyhoo, it took me 4 1/2 hours to decorate 47 cookies. And because sometimes I dig numbers, I spent a total of 9 hours, or 540 minutes on them over the last 3 days. Which is about 11 1/2 minutes per cookie. Which in truth and my reality, isn't too bad. Considering the amount of time I put into crafts. And more recently, on learning how to play the guitar. And the surprising thing, at least to me, is that I would totally do it again. I so did not hate the process like I expected I would. Christmas Tree of The Day!! Once again I was walking home and hadn't spotted a suitable tree for today. But I remembered that most of the hotels have really nice ones in their lobby. 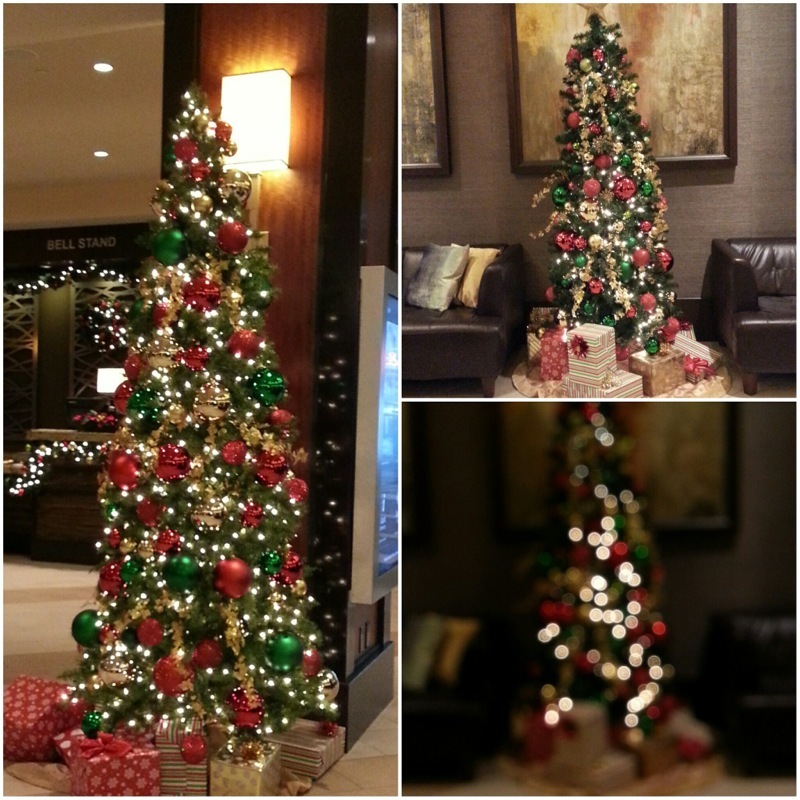 I was surprised that the Marriott had relatively basic trees, but they had a lot of them. 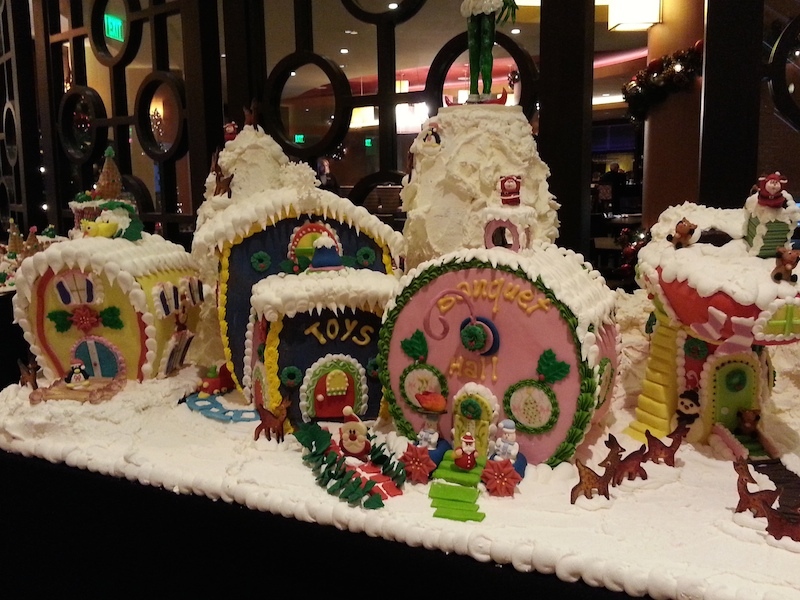 They also had a gingerbread house contest in their lobby. These are FANTASTIC detailed tips. They are rock stars. 1. Clear some counterspace: Iced cookies need at least 24 hours to dry, so clear a good amount of counterspace or tablespace where you can ice the cookies and leave them undisturbed. Cover the counter with parchment paper. 2. Arrange cookies for icing: Allow fresh-baked cookies to cool completely, then arrange all your cookies over the parchment paper. You might find it helpful to leave a small workspace clear in front of you where you can move each cookie as you’re working on it. 3. Prepare the border icing: Mix together the powdered sugar, vanilla, and 2 tablespoons of milk or water for the border icing using a spoon or a fork. It should be quite thick, and if you drizzle a little from your spoon, the ribbon should hold for a few second before melting back into the icing. This border icing should be just thick enough to pour easily. If desired, add food coloring to this border icing now. 4. Transfer the border icing to a squeeze bottle: Insert the funnel in the mouth of one of the squeeze bottles. Spoon some of the border icing into the funnel and let it drip into the bottle. Since this icing is so thick, it can be difficult to get it to drop into the bottle — you can squeeze the bottle to suction the icing and start it flowing. If it still won’t start flowing, add more milk or water one teaspoon at a time until just barely thin enough to pour (be careful of adding too much or else the border icing will pool instead of maintaining a border). Once flowing, it can still take a few minutes for all the icing to funnel into the bottle. Prepare your flood icing while you wait. 5. Prepare flood icing: Mix together the powdered sugar, vanilla and 2 1/2 tablespoons of milk or water for the flood icing using a fork or a spoon. This icing should still be fairly thick, but it should drizzle easily and a bit of drizzled icing should sink immediately back into the icing. If desired add food coloring to the flood icing now. 6. Transfer the flood icing to a squeeze bottle: Clean your funnel and insert it into a clean squeeze bottle. Pour the border icing into the bottle; this icing should be thin enough to funnel easily into the bottle. If necessary, add milk or water 1 tablespoon at a time until a thin, pourable consistency is reached. 7. Prepare as many batches of flood icing as needed to decorate your cookies. 8. Draw the borders around the cookies with border icing: Begin with the border icing and trace the outline of each cookie with icing. Hold the bottle vertical with the tip of the bottle slightly above the cookie. Squeeze gently and with consistent pressure so the border is the same width all the way around. Think of this border icing like drawing lines with a pen. If desired, you can draw inside the cookie — thicker lines are better than thin lines for separating areas of flooded icing. 9. Allow border icing to dry slightly: The border icing doesn't need to be completely dry, but the next step (flooding the cookies with icing) works better if the borders are at least dry to the touch. If you draw the borders on all your cookies before moving onto flooding, the first cookies will be dry enough to start flooding once you finish drawing the borders. 10. Flood the interior of the cookie with flood icing: Using a bottle of the flood icing, begin filling the interior of the cookie with icing. Use the nose of the bottle to push the icing into the corners and against edges. Think of this flood icing like using a paintbrush. 11. Allow the cookies to dry: Leave the cookies undisturbed for at least 24 hours to fully dry. Depending on the thickness of your icing and the layers on the cookie, it may take longer. When the cookies are dry, the surface of the cookies will be completely smooth, dry, and resistant to nicks or smudges. 12. Store the dried cookies: Once dry, you can stack the cookies between sheets of parchment paper in an airtight container at room temperature for several weeks. please visit their site to see all their detailed step by step images. I even bought the squeeze bottles they recommended.